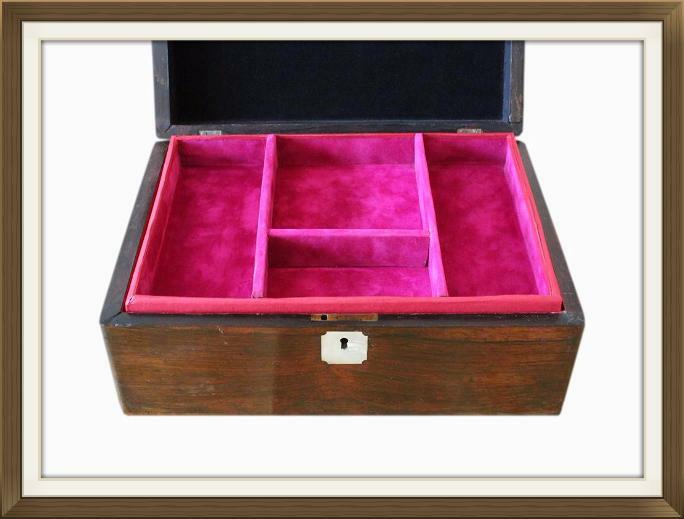 This is a beautiful large Victorian jewellery box, dating to 1880/90. 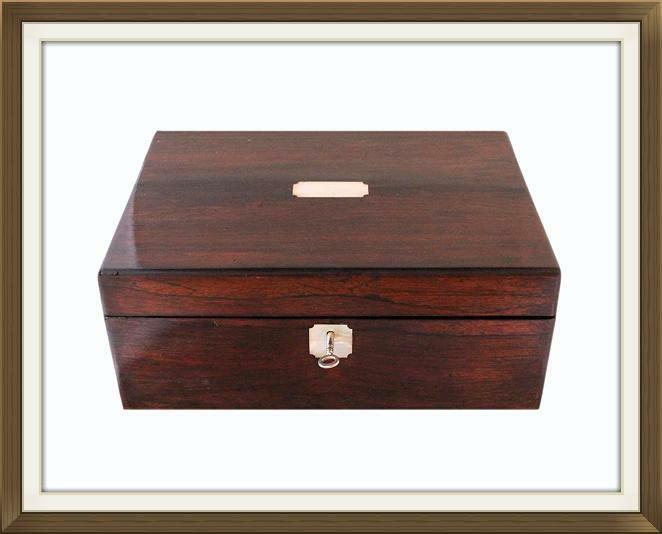 It has a wonderful Rosewood veneer and its original working lock and key. 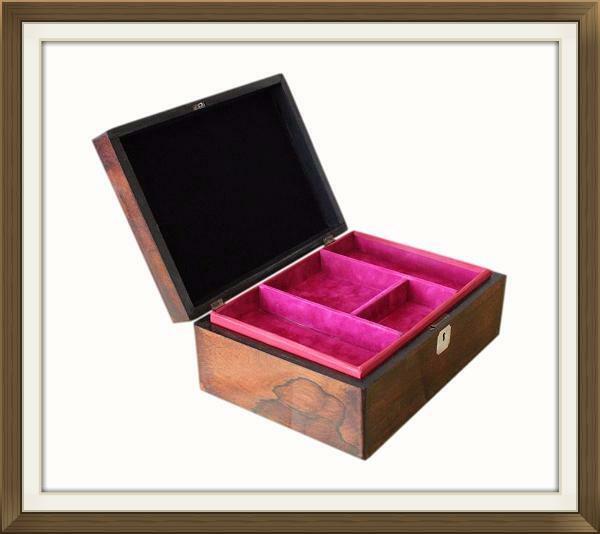 This box has a beautiful Rosewood veneer which has a wonderful warm rich colour. The Rosewood has lovely figuration and its characteristic black streaks. It also has a particularly nice pattern within the grain, on the left side of the box. There is a lovely Mother of Pearl cartouche on the lid, and a matching Mother of Pearl escutcheon to the lock. The box is complete with its original working lock and 'stop' hinges. These prevent the lid from falling back. There is a replacement key which locks the box securely. 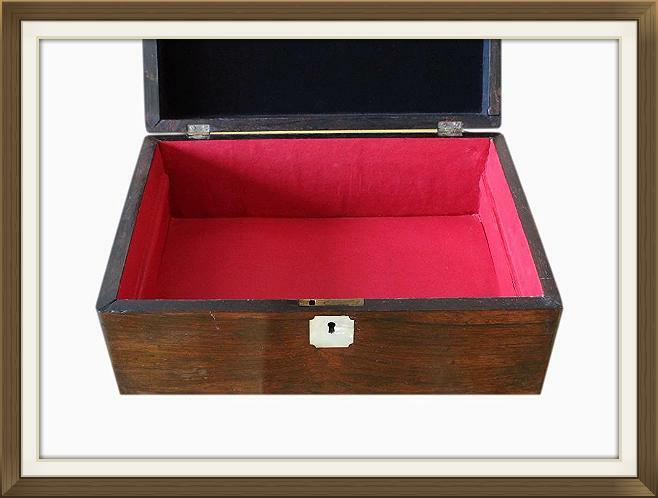 The interior has a large four compartment storage tray, and a further large single compartment beneath. The interior has been completely refurbished. The tray has beautiful soft felt linings which are a vibrant shade of pink, and the inside of the lid has a black felt lining. The exterior of the tray and the base compartment have a red paper covering/ lining. 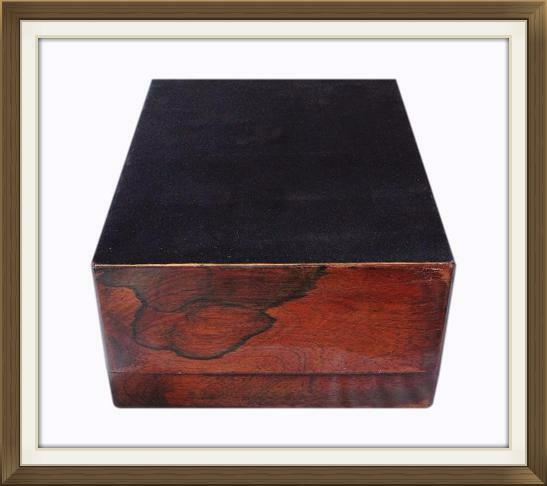 The bottom of the box has a black felt covering which will protect the surfaces of your furniture. This wonderful box is in excellent condition for its 120/30 years of age. It is a strong weighty box of sound structure. There is some minor light age related wear to the veneer, but no nasty cracks or damage. The Mother of Pearl is in lovely condition with no chips or cracks. There is a small amount of glue residue to the felt, in the left compartment of the storage tray. This is just along the edge of the right hand side, at the bottom, next to the partition. 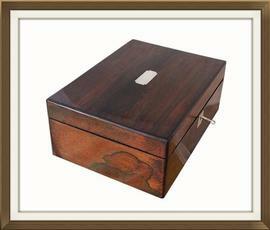 The box locks securely with its key and the hinges are in good working order. 18.6 by 7.2cm with a 3.2cm depth. 11.8 by 11.2cm with a 3.2cm depth. 11.2 by 6.3cm with a 3.2cm depth. 27.7 by 19.7cm with a 4.3cm depth. (7.9cm depth if tray is not in situ). This box will be posted FREE within the UK by Parcelforce Express 24hr delivery. International Postage is by Parcelforce Global Priority. Delivery is fast, within 3-5 working days to Europe, and 5-7 working days to the rest of the world.